Glycolic acid has been used for ages as a chemical peel and as a chemical exfoliant for skin and I’m a loyal user of Alpha H Liquid Gold so I knew all about its benefits. The thing of course, is that I don’t know what sort of percentage of glycolic acid is in this mask. I don’t think it’s very high if I’m to be honest, because I do feel it to be fairly mild. How to use the mask is simple. Put on a thickish layer of product all over and lie down and relax. I felt nothing, but those with sensitive skin might feel a bit of a tingle. The instructions say 10 minutes, but I usually have it on for longer. Sometimes, I watch a whole episode of a TV series which is about 40 minutes and then head off to wash it off. My face hasn’t fallen off yet 😛 Incidentally, the 10 minute claim does work. The nice thing is that this cream mask is easy to wash off. I hate using masks that don’t wash off properly. But this one rinses off with water, turning into a light texture like a face wash, and leaves skin feeling lovely, smooth, soft and clean. I experience no irritation but I didn’t quite like the sweet smell which is supposed to be the grape seed extract that’s infused in all Caudalie products. I find it a bit too sweet for my tastes, but then scent is a personal thing. After use, I do experience softer, clearer, smoother skin which is very nice. But does it last? It’s debatable. If you use this mask regularly (2-3 times a week) then you might notice a difference to your skin. It feels smoother, any acne or pimple spots fade more quickly and skin looks and feels less congested. If you use it once a week, you may notice a difference almost immediately, but it doesn’t last past a day or two. Naturally, this also depends on the condition of your skin. If you’ve never used a peeling product before then you may notice more pronounced effects and if you’re used to using these sort of products then you may find it too mild or that there is no effect. However, if you are also using other peeling products or glycolic acid products, be careful and don’t use this one too regularly or together with other peeling products. You don’t want to over-exfoliate your skin which can irritate it. While this one doesn’t feel drying on skin, I do also recommend that you follow up with a hydrating skincare routine thereafter just to calm things down and prevent any dryness you may feel. 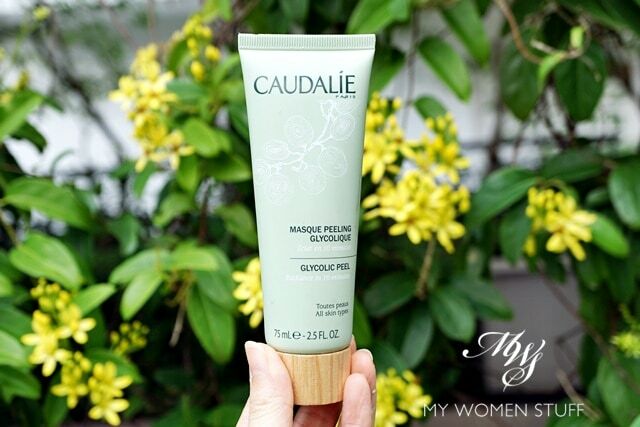 The Caudalie Glycolic Peel Mask is a mild, non-irritating cream mask that you apply and leave on skin before rinsing off with water. It rinses off very easily without leaving residue on skin. I experience no irritation using this product and I can attest to smoother, clearer, softer skin almost immediately. The effects last a day or two depending on the condition of your skin. I’m quite happy with it except for the sweet scent which I’m a little put off by. But as a gentle chemical peel mask, I think it’s a decent product for the price. 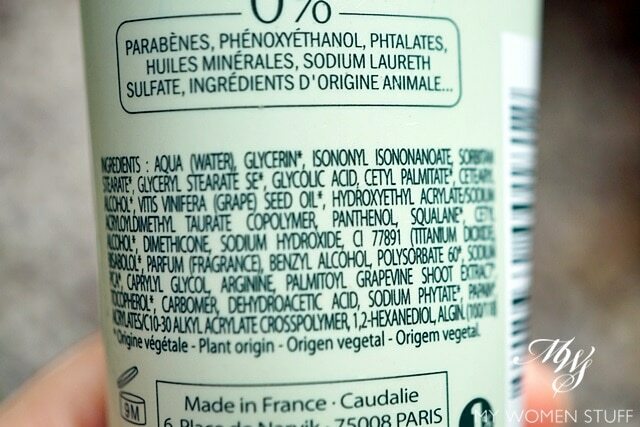 Here is the ingredient list for the Glycolic Peel Mask for your reference. Apologies for the blurry pic. Curved surfaces don’t photograph well apparently. TIP: I sometimes follow up this mask with a hydrating or rejuvenating sleeping mask or a face oil mask. I don’t know if Caudalie does one, but I like thinking that since my skin is all peeled, I can have all the benefits of my other masks seep in. I was thinking about the Moisturising Mask but I’m not sure. If you’ve tried it or the Instant Detox mask, I’d love to hear your thoughts on them. 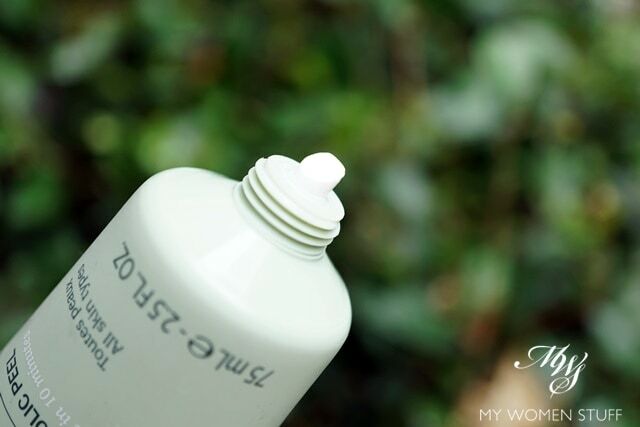 The old version of purifying mask is a clay mask. Ya.. it would be too dry if leave for too long, that is why I keep spraying water…. I thought I was the only one who leaves mask on for ages. Like for example, those sheet masks I leave on and go do stuff until it dries, instead of the 10 or 20 minutes as suggested on the pack haha. Also, I’m surprised the peeling mask is washed off, was expecting some peeling action going on. Y’know, those film-formers that creates this transparent plastic thingy on your face so you can literally peel-it-off. OMG DOES REVERSE-OSMOSIS REALLY HAPPEN WITH SHEET MASKS? Have been leaving them on for years! Oh dear. There’s a side of me that is umm… “cheap”… in a way that wasting even a drop of something (like sheet masks) will bug me. Even worse if the sheet mask is high-end (thank goodness it isn’t haha). Aw sad to hear you dislike those types of peeling masks, I find peeling them so satisfying hahahaha. I s’pose everybody is different. Like watching those acne popping/extraction videos bug me and gives me the goosebumps. Till this day don’t know how people can watch through the whole thing *shivers*. It’s what I was told, Robert but it’s stayed with me since LOL Better be safe than sorry eh? 😉 Now I remove them from my face but if there’s still leftover product, I put the mask on my neck. Waste not want not! As for the peel off masks, I remember the days when I first started messing with skincare and used peel off cucumber masks. Love them because it’s so satisfying to try to peel them off in one piece! haha!! But I now find these sort of masks too drying, like clay masks – so enjoy them while your skin allows you to! 😉 Oh and people put those disgusting videos online?! WHY?!?! You’d be surprised about those videos… they have millions of views too. The thought of it.. I can’t. hahaha. Ugh, this shiver just went up my spine! I am all for a product …. 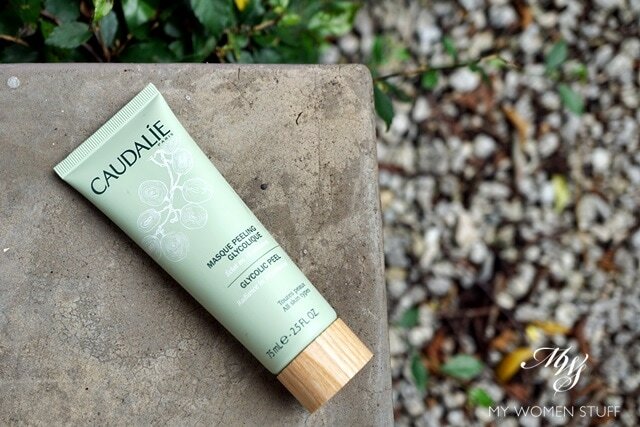 cream/mask …(whatever) which is able to add a dash of brightness to my face or tightens my (puddle like) pores and your review seems that this Caudalie product is able to give the face a some degree of radiance ,though the lasting power of the brightness is capped by a maximum period of 2 days. But honestly ,do we really expect the effect of the mask to last for a week?……..I love masks and currently use a bunch of Japanese masks and I am liking the effect of these masks. One such review is available in my blog. But Girls, would always like to try new things even if they have a stash of products. So I am game for this product and will definitely try. Sorry Paris My review has become long…. I never thought to try a mask with glycolic acid in it. I usually use the products in toners and serums. Looking forward to trying this one. New to your blog, happy to keep reading!